Late in 1914, Camborne Football Club (now known as Camborne Rugby Football Club) sent a rugby ball out to the front to the 25th Field Ambulance. 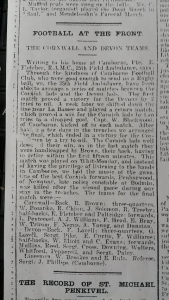 As a result, men organised three matches between Cornish and Devon soldiers in – the last in late spring 2015. 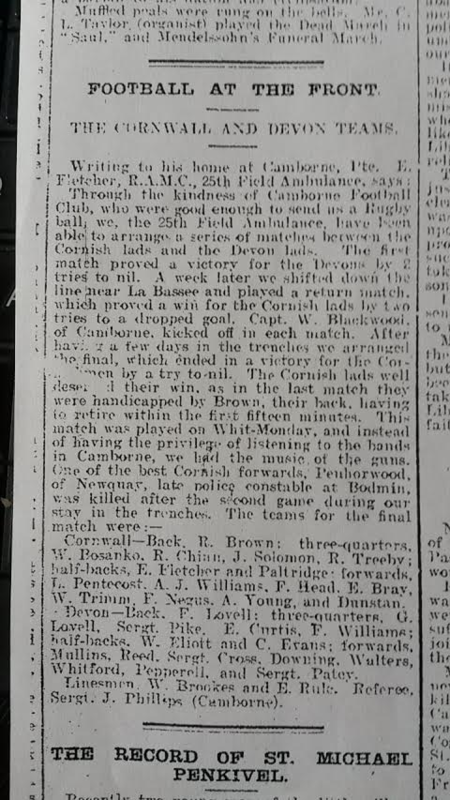 The Camborne doctor, Captain W. Blackwood, kicked off each match. Mrs Betty Fletcher, of Camborne, remembers that her grandfather-in-law, Ernie Fletcher played. Ernie wrote a letter home after the three matches which was published in the West Briton. Click here to read: the teams are listed. Captain W. Blackwood was a well-known doctor in Camborne. At the time of writing (January 2015) there are still people alive who remember him. He was at the Front in the early years of the War and took a keen interest in his fellow Cornishmen. Several in letters wrote to say how much they appreciate his concern and care for them. A letter from Capt. Blackwood dated 31 December 2014 was published by the West Briton.